An original recipe from The Tasty Page. Oh, this is Filipino comfort food right here. 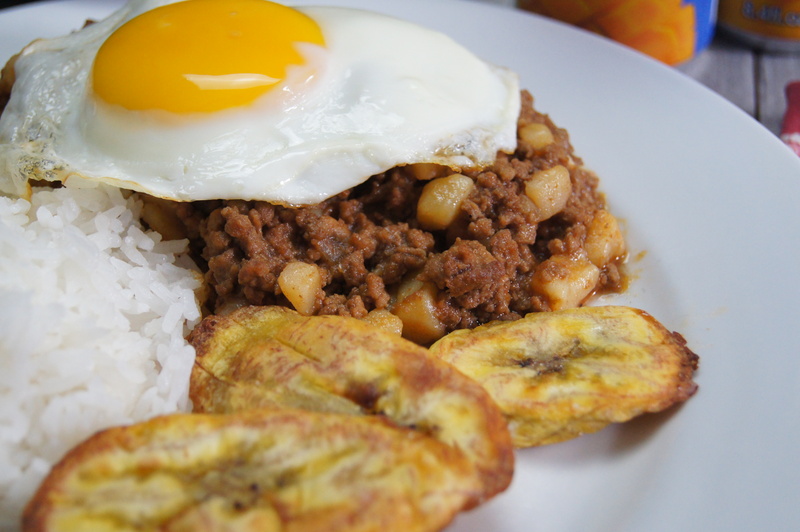 Arroz a la Cubana is traditionally made with ground beef and sauteed with diced potatoes, onions, garlic, and tomatoes. And then for sweetness, raisins are added. That last ingredient there was always a buzzkill for me. Growing up, whenever I had this I thought it was always so much work to eat. Why? Because it takes a lot of effort to pick those raisins out! There was almost always a pile of raisins left on my plate. And c’mon? Raisins? Are you serious? But over the years, especially since my taste buds have changed and grown, for what I hope is the better, I’m OK with the raisins. Especially it means that I’m biting into an empanada with a filling similar to Arroz a la Cubana. Oh, how good does that sound? 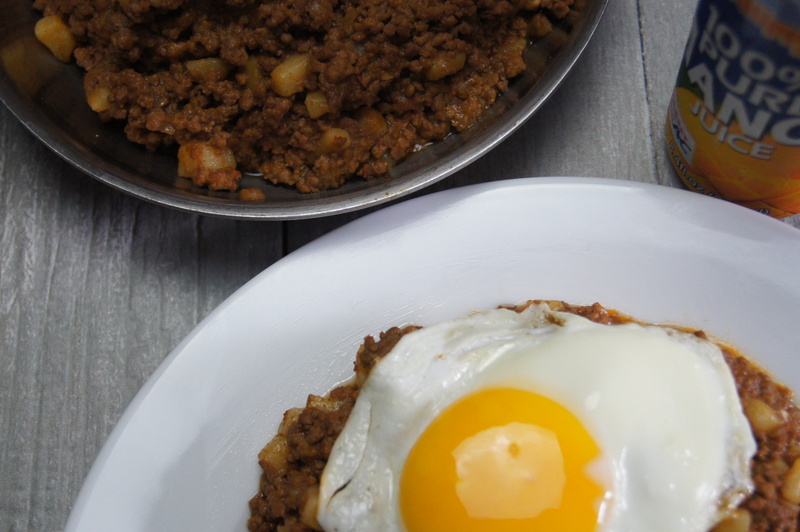 Raisins or not, this Filipino recipe is really delicious and comforting. 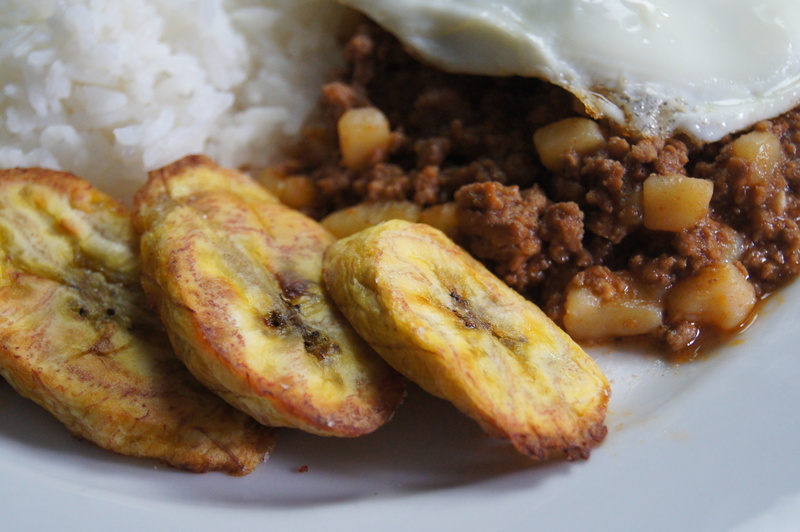 I don’t have it very often, but when I do, I have to have it with rice, a fried egg, and plantains. It’s part of the whole experience. To lighten it up though, I would have this with cauliflower rice next time instead of regular rice. Sorry, my Filipino friends. I know, that sounds so wrong. But what isn’t wrong is having some good, legit Filipino mango juice with Arroz a la Cubana. It used to be a little hard to find Filipino mango juice and when I could find it, it was never in a nearby store. But then one beautiful day, I was at Trader Joe’s and saw Philippine Brand Mango Juice on the shelves and was elated. So elated that I almost busted out my bamboo poles and started dancing the tinikling. But then realized that would be impossible since I was by myself and the tinikling involves at least three people. It’s kind of like double dutch, but with bamboo poles. And you can guarantee that I’m laughing by myself right now thinking of me trying to do a solo tinikling, let alone walking around with bamboo poles. I like to double the recipe so that I can have leftovers to make Tortang Carne, which is basically an Arroz a la Cubana omelet. 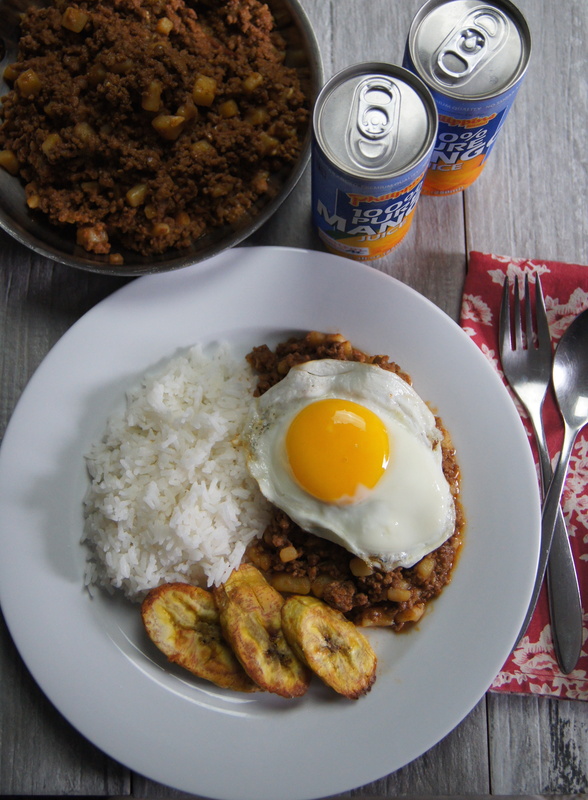 My family and I are having the Arroz a la Cubana for dinner tonight and if there are leftovers I’ll definitely make Tortang Carne and share it with you. I hope you get a chance to make this, especially if Filipino food is new to you. You can even add raisins if you’d like. I won’t hold it against you. Brown meat in a skillet over medium high heat, 5-7 minutes. Drain any excess fat. Stir in garlic for about 30 seconds, or until fragrant. Add onions and tomatoes. Stir for a minute or two until onions and tomatoes soften. Season with salt, pepper, pinch of sugar (or raisins, if using), soy sauce, fish sauce, and Worcestershire sauce. Add diced potatoes. If the mixture is a little dry, add ½ cup water. Cover and cook, stirring occasionally, until potatoes are tender and water has evaporated, about 7-10 minutes. Taste for seasonings and add more salt or soy sauce or fish sauce, as needed. 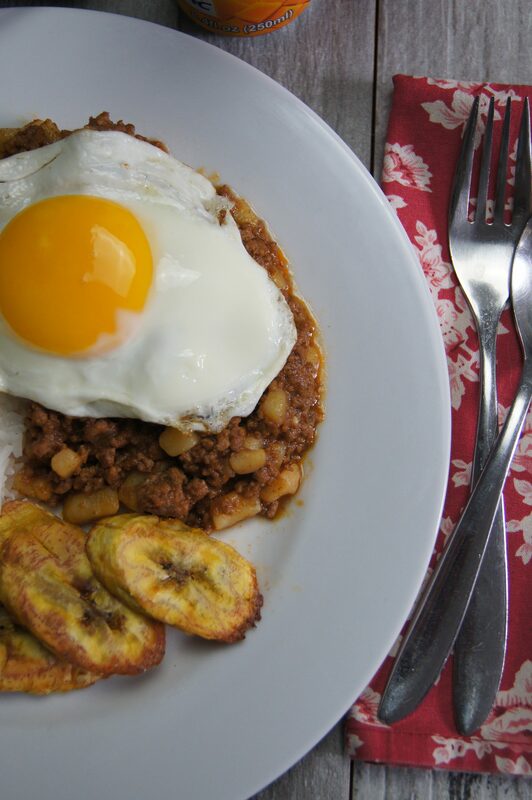 Serve with rice, fried egg, and plantains.